5793 labyrinths found. Showing 1621-1640. Sorted by country, state, city, then zip/postal code. Welcome! 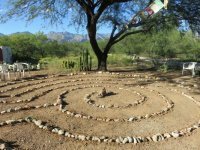 Our labyrinth was built and celebrated in October 2016. It's closed when private events are scheduled. You can get there by walking southeast from the south border of the park along the horse trails, and follow the trail that forks to the right with the park sign about coyotes, or by driving north on N. Cactus Blvd from Prince Rd. and looking to the west. 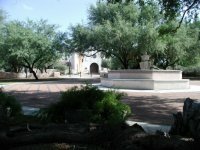 Located on Unity's 18 acre campus, south on Camino Blanco which is between Craycroft and Swan on River Road. Handicap accessible and available 24/7. 32.1631.88 N° Lat. ; 110.5259.29 W° Long. 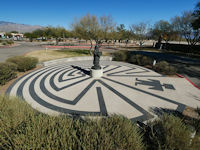 Labyrinth is in the Plaza in front of the Church. Center has a fountain and seating. Located 4 blocks north of Speedway Blvd., and 1 block west of Tucson Blvd. Church Office Hours: Monday - Thursday 9:00 am - 4:00 pm. Friday 9:00 am - 12:00 pm. Take Kinney to Naomi (just north of Cat Mountain Station) and take the first left into Cat Mountain Lodge. Labyrinth in in the back of the Lodge. Take Rt. 77 North to just south of Catalina. Church is on the West side of the highway. Open during daylight hours. Is not yet handicapped accesible, but will be at a future date. Call church at 520-825-1985 for change in accessibility. 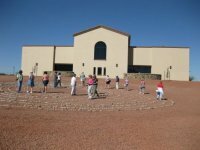 Outdoor Labyrinth on the side of the church. Open at all hours. 300 N. Tanque Verde Loop Rd. Just east of Houghton, just north of Broadway. The labyrinth is on the east side of the church. Modified 11 circuit Chartres with larger paths and center. Woodland Road is located on the South side of Tanque Verde Road, on the East side of the intersection of Tanque Verde Road and Catalina Highway. We are on the west side of Woodland Road, with a large boulder at our gate that says "Sunstone Cancer Support Centers." Monday through Thursday - 9:00-4:00. Friday through Sunday: by appointment only. 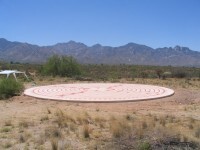 Our labyrinth was created by my women's group using the Chartres design. I would invite people to contact me, by email please, to arrange a time to walk it in peace. People would have to park at a community gate and walk to the property on a dirt road, approximately 600yds. North east Tucson, near Catalina Highway, Houghton Rd. and Snyder Rd. Northwest corner of Harrison and Summer Trail. I have 9 labyrinths and 3 mazes. One labyrinth is inside my Art Studio where you can ride a wiggle car. $2.50 per person, will receive a booklet on spiritual meanings of labyrinths, animals and stones. Plus a free stone to walk with. 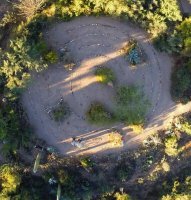 Classical 7 & 3 Circuit labyrinth, 1 Diamond shaped labyrinth, 1 Yin Yang labyrinth, 1 Custom Two Path labyrinth, 1 Medicine Wheel labyrinth, 1 Balance labyrinth,1 Nature labyrinth and 3 Mazes. River rock, stepping stones and dirt. 3 labyrinths & 2 mazes in 2004, 3 labyrinths & 1 maze in 2006, 2 labyrinths in 2007 and 1 labyrinth in 2009.